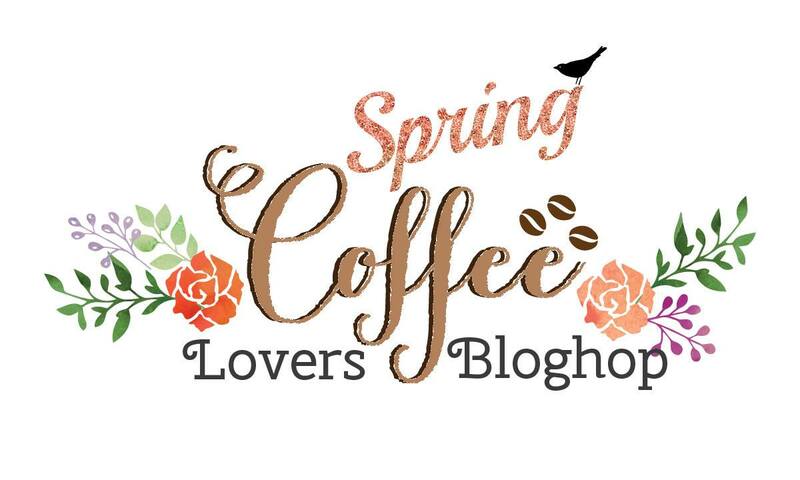 It's Amy here, so excited that A Jillian Vance Design is a Super Sponsor for the Spring Coffee Lovers Blog Hop! 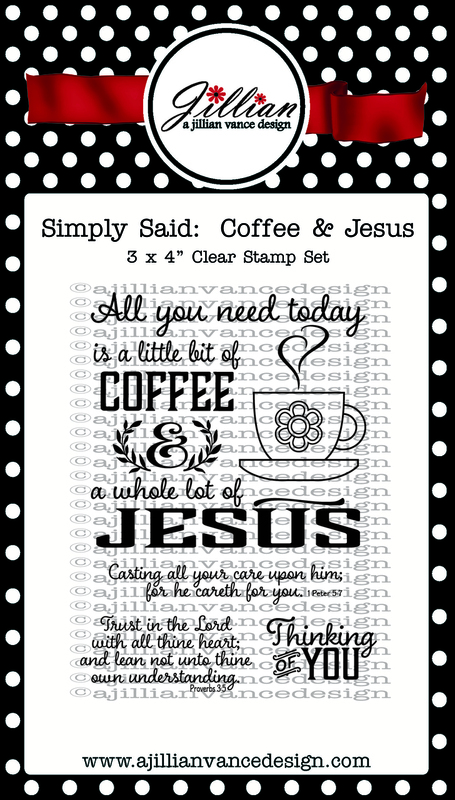 I used the Simply Said: Coffee & Jesus set! The possibilities of this set is endless! 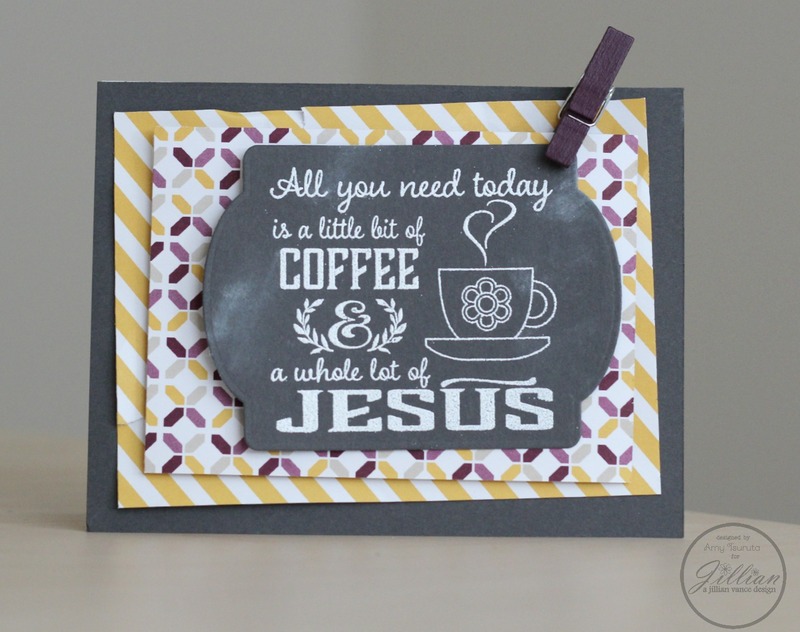 A Jillian Vance Design will be giving away the Simply Said: Coffee & Jesus set to one lucky winner! To be eligible for the prize, you must join in the blog hop fun and link up a newly created project! I can't wait to be inspired by all of the entries! I love your card and the sentiment, but most of all I love the chalkboard look of your card!! Awesome creation Love the chalkboard effect!! Oh my goodness! I so love that sentiment! Thanks for being a sponsor! Love it and the sentiment is wonderful. What a brilliant sentiment- I'm going to have to put this set on my wish list! Fab card! Awesoooome! This set goes to the top of my Wish List. Beautiful creation and I really love the sentiment! This stamp is in my wish list! chalkboard look with the sentiment is perfect. awesome card! Awesome card! Just love the whole thing...from design to colors to the sentiment....just AWESOME! Love the sentiment. So true. I like how paired the two different patterned papers. Really nice! I love the little smudges! Super cute card, and I love the sentiment!! Thanks for the inspiration!! I WANT THAT SET!!! HA! What a cute card to show it off with! LOL! such a fun set! love your card! GREAT card! So much fun! Love the chalkboard effect; such a pretty card! OMG Jillian... This is an AWeSOMe set!!! That should be a warning sign in all households with kids!! LOL... Love your chalkboard card!!! Totally loving this stamp set. Your card is fabulous as well! Thanks so much for sponsoring! Wonderful card, Jillian, love your chalk board sentiment...does the clothes pin mean you can change the message? Love the idea, inspirational. Have fun on this Frosty Friday hopping or crafting! What a cute card and stamp set! Thanks for being a sponsor! Hahaha - I'm just imagining this being said in my best old lady southern drawl. Similar to "Bless her heart". :D THANK YOU for being a super sponsor and helping to make this hop so much fun for all of us! Love the chalkboard look on your project! Ok, I just love that sentiment! I don't drink coffee, but I definitely need a WHOLE lot of Jesus every day. Great card! Such a great sentiment on your wonderful card! Thanks for your generosity. Cute card with a wonderful sentiment! Very cute. I like the chalkboard and the clothes pin. Very cute card and I love the sentiment. I work at a Catholic school and everyone would love to see a cute sign with that sentiment over the coffee maker. Well done. Fabulous card and I would love to win this set! Thanks for the chance to win. Great card! Love that chalkboard look! super fun card by Amy! LOVE the chalkboard look... gotta try it! Fabulous card and wonderful technique.Thanks for sharing your coffee and most of all:Jesus. Thanks for sharing such a fun technique! I love the card. Coffee on! What an awesome stamp set! Love the chalkboard effect! Thank you for sponsoring the hop! Beautiful card. And a great sentiment! 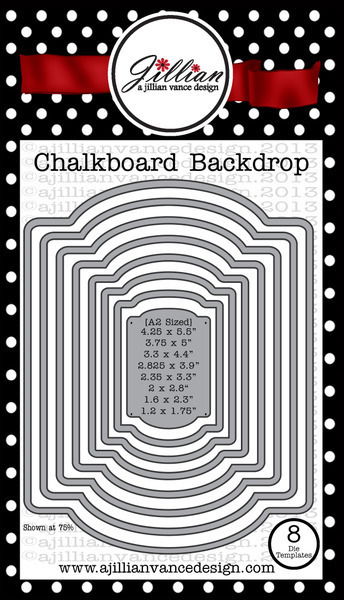 Love this "chalkboard" card and the dies are perfect. Thanks for sharing and sponsoring. I love this stamp set! Thanks for being a sponsor! well, isn't that a fantastic sentiment! I love it. and the chalkboard is great! Fabulous card Amy and isn't that the truth! Always love the chalkboard look...so perfect with coffee and truth! TFS! Love the awesome card and sentiment. Thanks for sponsoring the hop! It's all adorable, but LOVE the chalkboard dies!! Love the chalkboard look and sentiment! This is awesome love the chalkboard look and such a pretty sentiment. Love the chalkboard design...and those dies are fab! 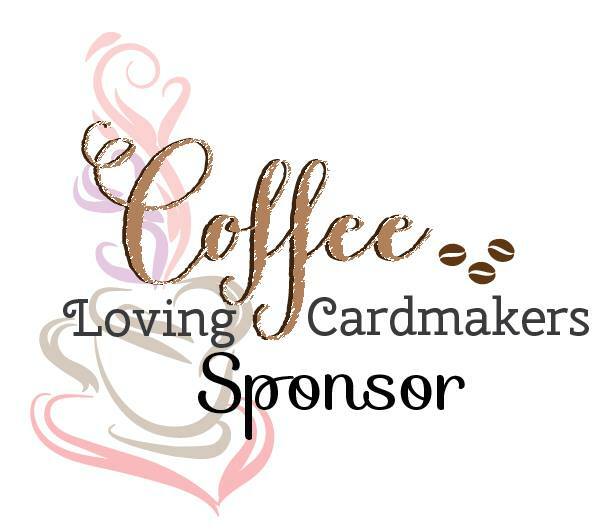 Thanks for being a sponsor! Wow! Love the card! I could use that stamp for all my friends! Love this card and stamp set! Oh, that stamp!! How fabulous. And perfectly used on your great card! Love how you used the chalkboard technique Amy. Yes, we all need Jesus! Love this card! Such a great sentiment and I really, really like the chalkboard backdrop! Great job! Thanks for sharing, for the inspiration and for the chance to win! Such a perfect chalkboard look! What a great card. Wonderful and inspiring card!! Thanks for all your work in this hop and thanks to AJV for sponsoring!!! LOVE this set. What a great inspirational card. That stamp set is Oh My Goodness, too cute!!! I love your chalkboard effect card! OMG that is so crazy that you have a stamp set that says this. My girlfriend just read that to me today. She seen it on pintrest. Awesome Card!! 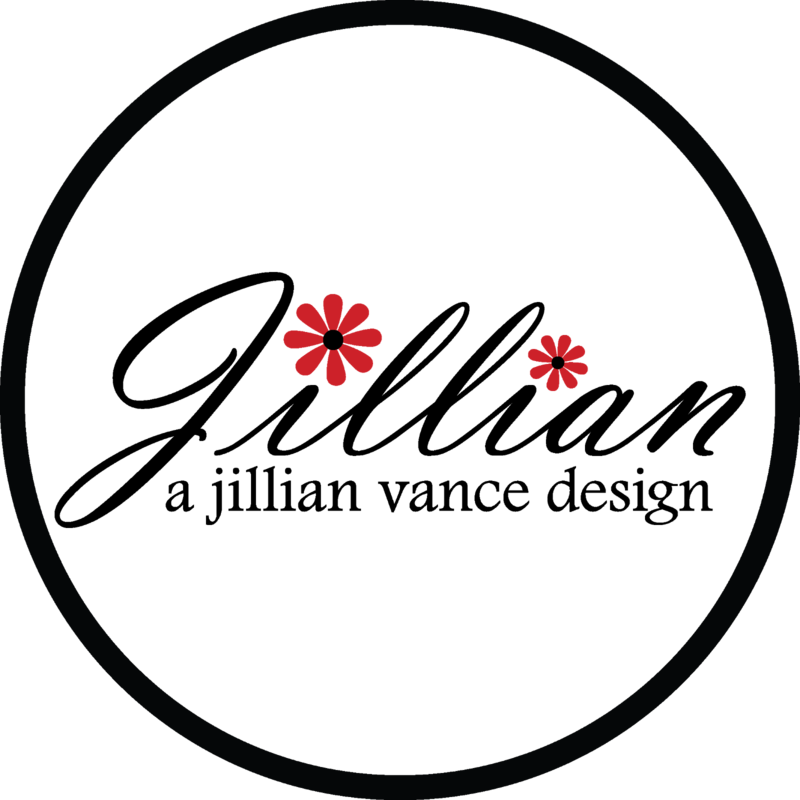 super cute, love the sentiment....thanks for sponsoring!